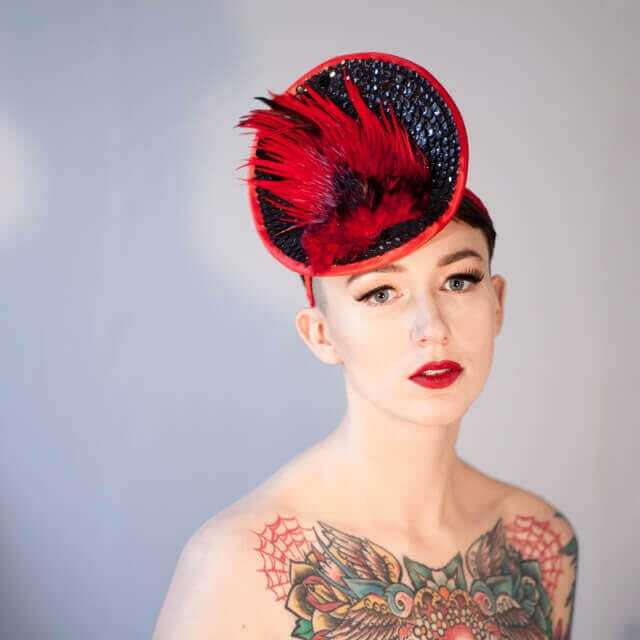 Red feather and black sequin headpiece. Perfect for a summer wedding or the races! This hat is from my new collection called ‘The Birds’ which is inspired by Alfred Hitchcock’s leading ladies! 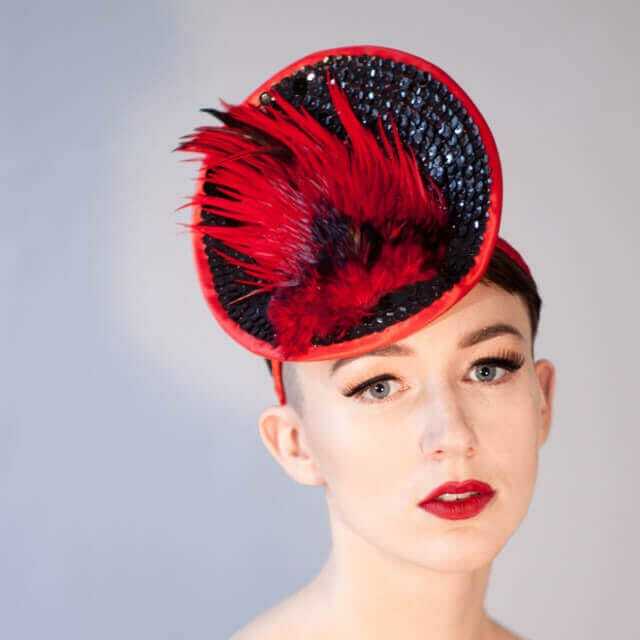 I studied Millinery at Kensington & Chelsea College, London where I was taught all aspects of Millinery from theatrical to high fashion and block making to illustration. After graduating in 2006 I moved to Melbourne and became assistant to Richard Nylon, Australia's most famous milliner. After returning to Scotland I set up my own business designing and making hats for both the bespoke and commercial markets. 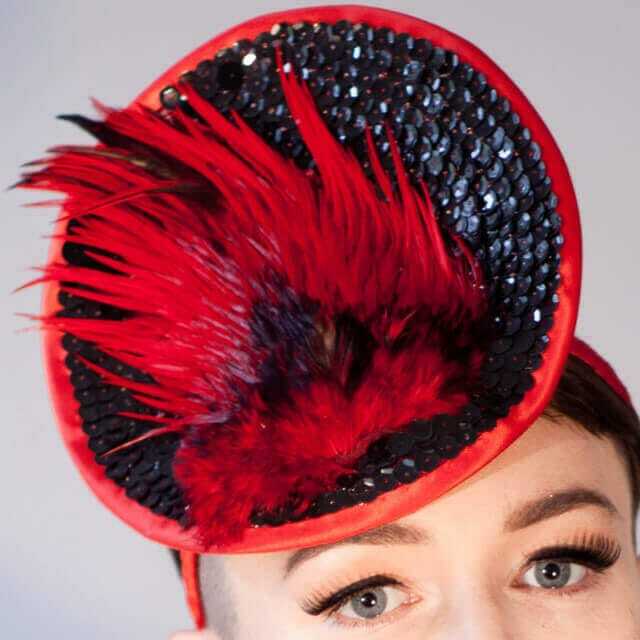 My work is made using Traditional Craft and I love sharing my skills by running workshops in schools and museums throughout Scotland in a bid to keep the art of millinery alive and to inspire young people to get involved in the Creative Industries. I am inspired by lots of things from architecture to nature. I seem to get a lot of inspiration from people and have made collections based on David Attenborough, Audrey Hepburn and Celia Birtwell to name a few! Personally, I am obsessed with the 1960's which is quite ironic given that was the decade that killed millinery due to the introduction of certain hairstyles like the beehive and five-point bob. From a millinery point of view, my favourite styles are from the Victorian period with the Jazz Age style from the 1920's a close second! As well as running my own brand I frequently collaborate with other companies like Harris Tweed and the Royal Conservatoire of Scotland. I have had many exhibitions of my work throughout the UK and my work has been used by British, Turkish, Russian and Spanish Vogue.